Looking for a healthy, satisfying, and super delicious way to eat? Take a hint from the latest U.S. News and World Report— Go Mediterranean! The Mediterranean diet is the world’s healthiest diet (and easiest to follow too!) If you’re not familiar,you’ll want to check out this quick overview of the Mediterranean diet plus my list of the best Mediterranean diet snacks. Trust me, this healthy way of eating feels anything but a diet! And you’ll love all the tasty options. When you get to the end of this post, be sure to read the notes and check out more resources. Having evaluated more than 40 diets out there, the U.S. news and world report ranked the Mediterranean Diet #1 overall healthy diet for 2019. But in a nutshell, eating the Mediterranean way basically involves eating more from the wider base of the Mediterranean diet pyramid (below). That means whole grains, fruits, vegetables, legumes, herbs, spices, nuts and healthy fats like olive oils. Oldways calls them “core foods.” Then, fish and seafood, about twice weekly. Moderate portions of dairy, eggs, and occasional poultry. Finally, infrequent servings of red meats and sweets. To learn more, check out 7 ways to follow the Mediterranean Diet! What Snacks Can You Eat on the Mediterranean Diet? Now to address the question of the day: what kind of snacks can you eat on the Mediterranean diet? The key to answering this question is again in the Mediterranean diet pyramid. Find snacks that fit the Mediterranean way of eating—mainly from the base of the pyramid. Things like nuts, fruits and vegetables, occasionally dairy in the form of fat free yogurt or other healthy dairy options. If you need something on the sweet side, opt for a small portion dried fruits like dates, figs, or dried apricots. These are all great options and can be jazzed up to make a healthy, tasty snacks. I have a few simple ideas for you. Nutrition-rich are filled with fiber, antioxidants, protein, unsaturated fat and omega-3 fatty acids. Just a small handful of unsalted nuts (about 2 tablespoons) makes for a satisfying snack. And on occasion, if you’re needing a little something sweet, mix in a couple of figs or dates, or a small handful of raisins, for added energy and nutrition. #eattherainbow may be a trending Instagram hashtag, but fruits and veggies have long been a part of healthy old diets. For their many nutrition benefits—including vitamins, minerals, fiber, and antioxidants—and fresh taste, fruits and veggies are very much text-book Mediterranean diet snacks. A little banana is popular snack. But I love a little citrus fruit or a handful of berries for a bright, mood-boosting option. Tomatoes and avocados are my go-tos when I’m looking for something on the savory side. If you haven’t tried this before, I highly recommend sliced tomatoes and cucumbers or sliced avocados with a sprinkle of za’atar—a spice mixture of Mediterranean wild thyme and toasted sesame seeds— and a drizzle of Early Harvest extra virgin olive oil. A tiny sprinkle of feta, if you need to. You can do the same with bell peppers, summer squash or other veggies of choice. One fun snack that my children love is baked zucchini chips. You can make these ahead and keep them on hand! Legumes and pulses are rich in plant-based protein and fiber and low in fat, so they can help you feel fuller longer. And if you’re eating the Mediterranean way, you’re likely incorporating legumes and pulses in many of your meals. But they also make a great snack, if you are particularly hungry. If you have leftovers from say yesterday’s chickpea egg salad or balela salad, a little portion will go a long way in satisfying that mid-afternoon hunger. By the way, handful of crunchy roasted chickpeas, jazzed up with harizza or za’atar is an awesome snack. Recipe coming soon! Greek yogurt is lower in sugar, rich in calcium and vitamin B-12. It also contains live cultures, or probiotics, that can have a number of health benefits, including regulating digestion and boosting your immune system. And because it’s rich in protein, it will keep you full for longer. A small portion (like 5 ounces or less) of plain Greek yogurt (fat-free or low fat) with a little fresh fruit is a good snack option, once in a while. Try to find organic Greek yogurt (plain, of course) that has been properly strained. Some manufacturers add a thickening agent to yogurt, which does not provide the same benefits. This is a bit of an outside-the-box Eastern Mediterranean snack. It involves excellent extra virgin olive oil, Za’atar—a spice mixture of Mediterranean wild thyme and toasted sesame seeds—and a small with a small portion of whole wheat pita or your favorite whole grain crusty bread. The idea is not so foreign really. You’ve dipped a piece of bread in olive oil before, haven’t you? What you do here is simple. Take a small bite-size piece of the bread, dip it in the EVOO, then dip lightly in the za’atar spice…and eat. Now, a bit of a shameless plug, but it’s really my sincerest advice to you. If you’re going to do this EVOO and Za’atar snack, you’ll want quality ingredients. I highly recommend Early Harvest Greek extra virgin olive oil (from organically grown and processed Koroneiki olives) and our all-natural za’atar spice. Early Harvest extra virgin olive oil is a prized agoureleo from the Kotsovolos Family Estate in Christianoupolis, Greece. It is the real deal; exquisite in taste and quality. Two last things to add here. People of the Mediterranean generally don’t snack too much during the day. Remember that frequency and portion control are still important even if you’re snacking on healthy options. I can’t advice you on how many snacks or how much you need; this is something you will know better with the help of an expert or your doctor. *Disclaimer: Before you begin any new diet plan or a new way of eating, please consult a professional or your doctor to receive expert advice particular to your needs. This article is written from personal experience and the result of personal research. 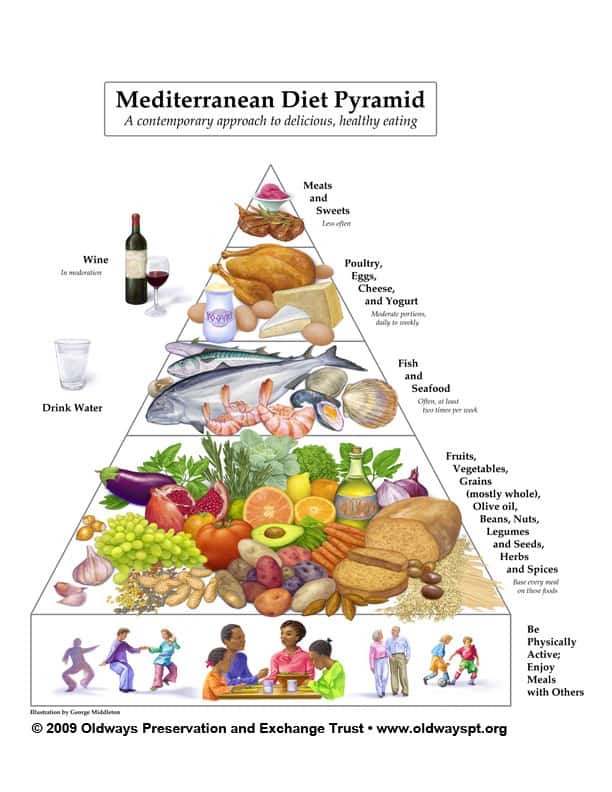 Special thanks to Oldways for the use of the Mediterranean diet pyramid. The post Best Mediterranean Diet Snacks appeared first on The Mediterranean Dish.